Get this hard-to-find, Complete 12-Coin Collection of Oh! Canada Series pure silver proofs set that celebrates twelve iconic touchstones of (and all that is great about) Canada! Celebrate Canadas uniqueness with the Oh! Canada's national identity is much like its majestic landscape: diverse, storied, and always fascinating! In the ever-changing world of Canadiana, a few concepts tend to reflect the nations natural assets and social and cultural institutions. Born of this complex background, these twelve Canadian icons. Are undeniable touchstones of the majestic land, its wildlife. These are the scenes that plumb the depths of Canada's own pride in itself, while kindling the world's love for the great nation that is Canada! Proofs in a solid wooden presentation case - then revisit your coins again and again to marvel at their cultural significance and detailed imagery! Definitively Canadian Pure Silver Proofs! A Highly Detailed, Original Work of Art! Each release in the O Canada series. Features a meticulously rendered design - an original work of art by a practicing Canadian artist! The Mint's traditional-style engraving has produced a magnificent work of beauty. The distinct design hallmark of the O Canada series has the central image set between two semi-circular banners (each laser polished to a gleaming, mirror-like finish) with the top band proudly proclaiming the legend Canada, and the denomination in the lower band. Complete 12-Coin Collection Proof Set in Solid Wood Case! The Royal Canadian Mint refines the purest silver in the world. The RCM is also the only mint in the world to issue commemorative coins in a. Each silver proof coin is 99.99% pure! A meticulously detailed and finely engraved portrait of an emblematic Canadian theme on each coin! The traditional-style engraving has produced a magnificent work of beauty. The date and denomination are also indicated. Her Majesty, Queen Elizabeth II. This portrait, the fourth effigy of the queen to appear on Canadian Coinage, was executed by the artist Susanna Blunt. The legend ELIZABETH II D. REGINA ("Elizabeth II, Queen by the Grace of God") also appears. The coin is encapsulated inside a solid wood display case, lined with black velvet and protected by a full color outer box. Twelve individually-numbered (non-matching numbers) certificates of authenticity is included. 120 Dollars (12 x 10 Dollars). 190.44 g (12 x 15.87 g). 40,000 Each Single Coin. Talisman World Coins and Medals has been in business for more than 20 years and is one of the largest world coin direct distributors and wholesalers in the world. 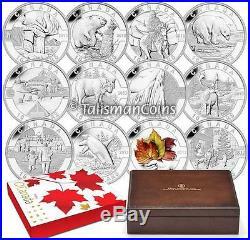 The item "2013 O Oh Canada Complete 12 Coin Set Collection $10 Pure Silver Proofs Wood Box" is in sale since Wednesday, January 15, 2014.